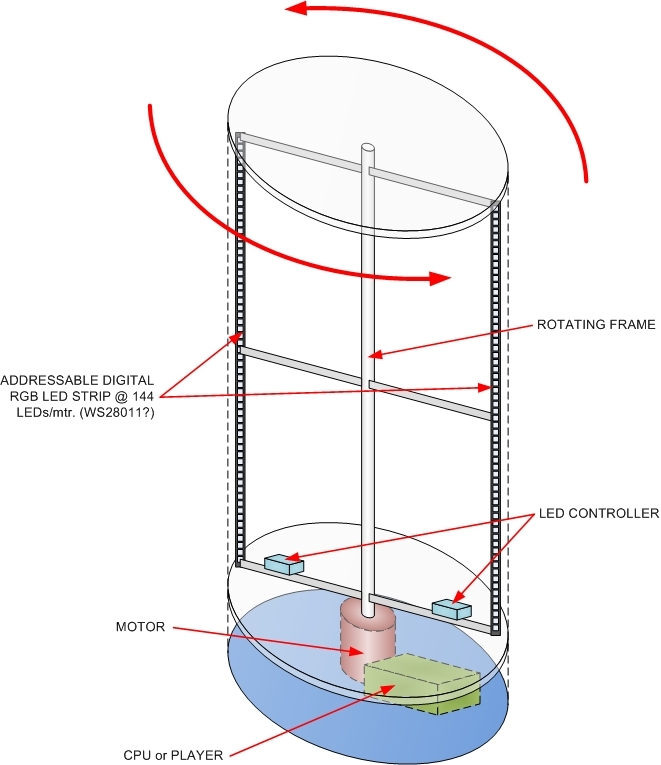 ​My son and I are trying to build a somewhat large Rotating POV Cylinder (or Globe) making use of ready-made Addressable RGB LED strips (WS28011 or LPD8806?). After some browsing, we found that many of the stuff in the web make use of Arduino and similar micro-controllers. They also create their own codes or programs. Since we are not that technically competent, we would prefer to make use of our windows-based PCs or the T1000 controller for the LED strip, if this is possible. If not, my son knows a bit of C+ and Python. We would attempt to play video or a series of images to the Rotating POV device. We are considering to use a Raspberry Pi since I intend to show videos in the POV and make use of a large number of addressable RGB LEDs. Could the controller just play one line of pixels of an image in a portion of a microsecond while it is rotated to produce the desired image? Most of the POV samples in the web are only several pixels high while I am thinking of something that is around 120 to 240 pixels high. What readily available micro-controller or micro-processor do you suggest and why? What Addressable RGB LED Strip should I use? We are considering the WS28011 strips since they have as many as 144 LEDs per meter. There is a T1000 controller. Can this be used? Are there ready-made applications that will allow to display videos in the Rotating POV Cylinder (such as the LedEdit for LED matrices)? Perhaps we could acquire the output of the LedEdit app and divide these into columns. Below is an image of what we are trying to achieve. We would appreciate your comments and feedback. I would just want my son (and I in the process) to learn from something that seems to interest him. You will need very robust mechanical components to support something tall spinning fast. Ideally you'd put another bearing on the top. Balance will be important. It would be easier with 4 strips. You need a way to make it safe, which means enclosing it. A clear acrylic tube would work nicely (and give you a way to mount a top bearing), but it's not going to be cheap, and it may diffuse the light. I don't remember what the viewing angle of the RGB LEDs is, but it's not great. You viewing part will be, at best, the 45 degrees of the cylinder that is facing you. Power and data to the LEDs will be problematic. You could push power with slip rings (as long as you filter on the LED side), but I doubt you can push data over it. That leaves you doing something wireless to get the data out there, perhaps 802.11 or 802.15, or something else. Since you need a high data rate for POV, you'll need to do a good job here. WS2812 is great, but according to Phillip Burgess at adafruit, in "The Magic of NeoPixels", it's not good for POV. They recommend LPD8806. Because "the WS2812 ... refresh rate is relatively low (about 400 Hz), and color displays in fast motion may appear “speckled.” ... For POV use, LPD8806 strips will look much better (they have about a 4 KHz refresh rate)." You can drive ws2812 with the Pi, but you need a special library to do it, and I'm not sure what data rate you get. You will definitely need to write code for this project. What you want is very close to Stargate Eggbeater. It uses Raspberry Pi, a continuos strip of 142 LPD8806 RGB LEDs, and a slip ring to solve power tranfer to rotational object. Not the answer you're looking for? Browse other questions tagged microcontroller raspberry-pi microprocessor led-strip pov or ask your own question. How efficient are RGB LED strips? Powering 30m of RGB LED strips?